Since the explosion of the vast frontier of the internet many have attempted to conquer this new space. Some called it the white space, a new battlefield that everybody is magnetized. It is a space that gave birth to millions of jobs and new millionaires. I myself is still trying to grasp the enormity of this new space. I myself is trying to make sense of this unique animal that when tamed can give enormous wealth. Good thing that there is an event slated tomorrow that will introduce us to some of the peculiarities of Google’s adwords – one of the most important moneymaking tool in the internet. It is a two day affair that may happen again next year, and it’s a very long time if that is the case. So I invite you to attend this opportunity and grab every bite of what you can learn. Definitely, it will be a big help. 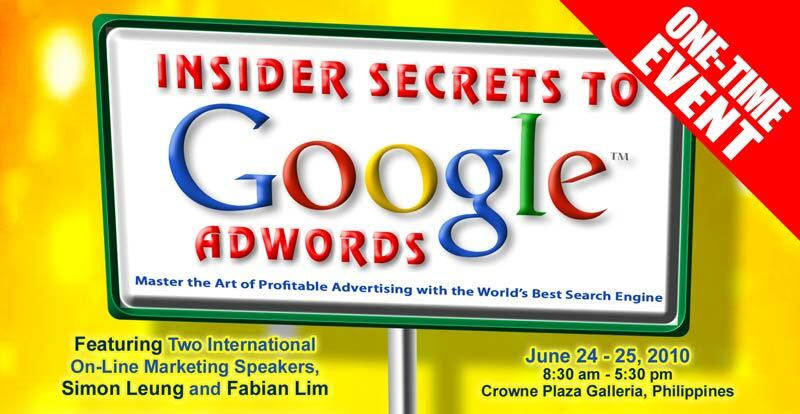 The event takes place in Crown Plaza Ortigas, you may walk-in or call tel# 643-3887. The investment rate is P10, 595 + vat. Speakers are from Singapore, they are Simon Leung and Fabian Lim. They are both experts in internet marketing, so the time you spent hearing them is worth it. See you there and let us exchange knowledge in this once in a lifetime event.